When most people think of the Midlands, they think of a place neither here nor there – a grey area in Britain with no discernable features of its own. Academics interested in the study of the Viking Age have tended to look at areas further north such as York when thinking about Viking settlement, mostly because the surviving literature we have points to these areas as being key in the Scandinavian colonisation – but here at Nottingham, staff and students alike are keen to bring the Vikings back to the Midlands by re-asserting the significant impact they made here. 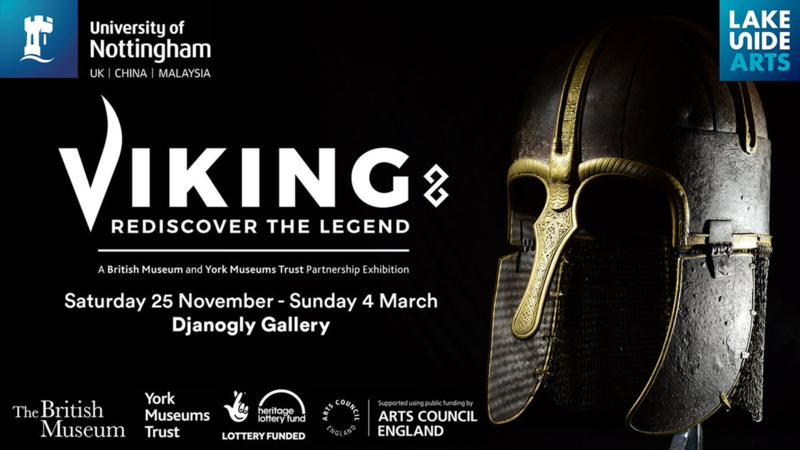 With a wide-ranging collection of artefacts from Lincoln, North Yorkshire and more, the Viking: Rediscover the Legend exhibit at the Djanogly Gallery, Lakeside, utilises various different spaces in order to display different forms of evidence for Viking settlement that has been discovered in the regions of Britain. The spaces are easy to navigate and each area relates to a certain aspect of what life was like during the Viking Age: from jewellery to combs, spear heads to sculpture, there is very little (if anything) that isn’t addressed in some capacity at the exhibit. The accompanying signs are clear, informative, and accessible to a wide audience, from students to the general public. It is in this sense that the exhibition should be regarded a huge success, and the entry numbers to the exhibition since its opening speak for themselves. But one thing that does crop up in conversation is this: how can an exhibition aimed predominantly at a non-specialist audience benefit students on an MA in Viking and Anglo-Saxon Studies? The answer is simple, at least it is for me. Having been introduced to the Viking Age in my first year as an undergraduate here at the University, I remember all too well how daunting medieval history can be to someone relatively unfamiliar with it. The Vikings have been misconstrued in various different forms of media in popular culture, painted as aggressive, pillaging (and most importantly) male invaders, and it is hard to shake that idea when it’s all you’ve ever known. Abandoning that pre-existing concept of a period of history and re-evaluating it is difficult even as an MA student, but the exhibition challenges all of us to look at more than just warriors and mythology when considering the Viking Age. It challenges us to see the Vikings as home-makers, traders, gamers and fashionistas (visit yourself and you’ll be in awe of some of their jewellery!). As someone who works in heritage at the moment, and plans on doing so after graduation, I believe that challenging and questioning pre-conceptions about history is key to a successful exhibition. The locals as well as the students have received the exhibition with open arms and it is truly fantastic to see Nottingham reclaiming some historic identity and renewing an interest in a period of history most had already closed the chapter on. We students are grateful to bring Vikings back to the forefront of people’s minds, and thankfully, we can now do so in a capacity that isn’t The Avengers.